If you’re a terrorist laundering money to Hezbollah or smuggling illegal aliens over the border, this is the week to do it. At least, in Michigan–the heart of Islamic America. Just make sure you and the aliens aren’t wearing NFL or Superbowl t-shirts. Immigration and Customs Enforcement (ICE) Special Agent in Charge Brian Moskowitz a/k/a “Abu Moskowitz” is taking ICE agents all over Michigan off the job of protecting us . . . so that they can help NFL billionaires. What Me Worry (About Illegal Aliens)? I Have a Superbowl Party to Attend. In July, we wrote about Major League Baseball’s All-Star Weekend and how Immigration and Customs Enforcement (ICE) Agents were busy keeping you safe from the dangerous t-shirts. Now, the weather is colder and the game is football. Different season and sport, same story. Abu Moskowitz is busy trying to get his picture in the paper and in sports media outlets far and wide. We appreciate Lilliput native Abu Moskowitz’s desire to engage in the proverbial jock-sniffing (and maybe a swanky Superbowl party invite from R. Kelly and Diddy) that comes with being an ineffective immigration law enforcer and terrorism money-laundering stopper in the vicinity of the premier televised sports event. But not all his agents appreciate being National Football League Properties’ auxiliary trademark enforcement police. Can you blame them? “There will be a much bigger team of Detroit police and Customs officials that will be out with the NFL” than there were at previous Super Bowls, Guibault said. “There’s the potential to catch a lot more counterfeiters,” she said, particularly since Detroit is a border crossing. All agencies involved assign more officers every year to the effort. Officials from U.S. Immigration and Customs Enforcement (ICE), the Detroit Police Department and the National Football League are gearing up for Operation Gridiron, a law enforcement initiative around Metro Detroit looking for sales of unlicensed Super Bowl and NFL merchandise. Federal officials and NFL officials plan to announce the counterfeit crackdown at a press conference in Detroit on Feb. 2. We, taxpayers, pay for Abu Moskowitz and his agents to protect us from the illegal alien invasion and terrorism money-laundering and smuggling. But Abu M–the proud Donna Summers “Bad Girl” to the most extremist Muslims in town (including “former” terrorist and FBI award revokee Imad Hamad)–has failed miserably at both those tasks in his heart-of-Islamic-America jurisdiction. And most of the press he’s gotten on these topics has been on this site and others excerpting and reprinting from it. So, Abu M figures he can please his glad-handing enablers at ICE Headquarters by working for the billionaire NFL owners and getting some positive press in places like ESPN.com. Problem is, the person who pays Abu M’s and his agents’ salaries is Joe Taxpayer, not Joseph Billionaire NFL Owner III. While Abu Moskowitz is telling any press who will listen and pander–like his buddy, Detroit News fabricator David Shepardson–that he is having his agents enforce laws against counterfeiting by investigating those who produce counterfeit items and finding “terror links” (as he claimed to ESPN), his agents say otherwise. In fact, according to Abu M’s agents, all persons at baseball’s All-Star festivities caught by ICE agents selling counterfeit items were released on the spot, in exchange for relinquishing the t-shirts and hats they were selling. And none of their information was even taken by the agents. How there could then be an investigation is a question only Einstein (or perhaps, lesser light, Abu Moskowitz, could answer–but the pandering reporter didn’t bother to ask). Operation Gridiron is similar to efforts to find and deter fraud during last summer’s Major League Baseball All-Star Game in Detroit, said Brian Moskowitz, the special agent in charge of ICE. During the baseball sweeps, authorities confiscated about 16,000 illegal hats worth about $250,000, he said. The investigation is ongoing with an eye toward tracing the merchandise back to its maker. Hmmm . . . . organized crime and threats to the safety of the public–and Abu Moskowitz had his agents release the suspects without even identifying them?! Not very swift . . . assuming this is really a big threat. And it isn’t. Unless you are a member of the Rooney or Allen families . . . or any of the other select, elite NFL billionaires sharing in the pot. We’re all for capitalism, but let them pay for their own trademark police. The cost of the raid may be staggering, but Moskowitz sees it as important work. “Our focus is not the individual vendor,” Moskowitz said. “It’s the criminal organizations behind the vendors. Again, “terrorists”, “criminal organizations”, and “activity . . . worse than the counterfeiting.” Yet, Abu Moskowitz is releasing them without even a modicum of investigation. Well, at least he’s consistent on that year-round. We just hope we don’t see him at any Superbowl parties. We won’t feel any safer with him around . . . unless Mohammed is wearing a phony Matt Hasselbeck jersey. ICE shares responsibility on IPR enforcement with the FBI. ICE management’s worst nightmare would be for the FBI to generate a big dollar, high publicity case involving NFL merchandise. They (ICE management) would engage in any high publicity stunt to reduce the chances of that happening. IPR cases are fairly easy to work from an Agents standpoint, low in complexity, high in return and statistical value. 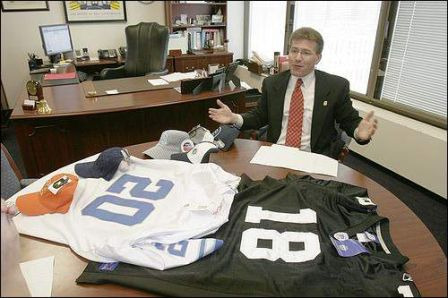 These cases don’t, for the most part, involve your sophisticated drugs-and-guns-for-t-shirt cartels, but rather energetic entrepreneurs who want to make a quick buck and are willing to take a chance and openly sell Super Bowl merchandise, believing that they will not get caught, and if they do, nothing will really happen to them. They’re not trying to finance terrorism. I am unaware of any IPR case worked by ICE (or US Customs) that was directly connected to financing a known terrorist organization. It is all about the continuation of an illusion and creating the perception that ICE is on the front lines of preventing terrorism, which is the stated mission of DHS and ICE. This type of operation does not and will not stop, hinder, reduce, redirect, or intercept terrorism in any way. But it will give the public the IMPRESSION that those goals have been achieved when, after the Super Bowl, ICE management can release statistics that state ” $x-million” dollars worth of merchandise have been seized and x-numbers of people have been arrested. The fact is, unless there are other circumstances involved (guns, violence, drugs, etc. ), the vast majority of these cases will NOT be prosecuted in Federal court. I am not at all opposed to the creation of a “task force” of sorts comprised of people from all the agencies (Federal, state, and local) to combat, detect, and eradicate counterfeit Super Bowl merchandise. All IPRs (not just NFL’s) are subject to protection and there are real violations of law taking place. But this needs to be balanced within the total mission and priorities of ICE. This should not be approached as an opportunity for an infomercial for ICE. Dedicating an entire SAC [Special Agent in Charge] office staff to this is erroneous and counterproductive, and simply put: bogus! IPR cases used to be good training cases for new Agents just out of the Academy–they were simple, fun, and introduced new Agents to a variety of law enforcement techniques and processes on a very basic level. They are not, and never have been, connected with terrorism. And if they were, who do you think would instantly take over the case from ICE in accordance with the ICE/FBI memo of understanding? The FBI! Ah my beloved little wannabe movie critic, have you forgotten http://www.imdb.com/title/tt0075765/ ??? Too bad Dallas isn’t in it, because then you could pose as a Cowgirl cheerleader and safeguard us slimey “liberals” from those al Qaeda boogeymen…time to go watch Herr Bush!!! APPARENTLY, YOU’VE FORGOTTEN IT. THE PLOT INVOLVES A TERRORIST ATTACK ON THE SUPERBOWL BY A VIETNAM VET, NOT BY INANIMATE “COUNTERFEIT” T-SHIRTS SOLD BY A FEW UNDERCLASS ENTREPRENEURS TRYING TO MAKE A BUCK. HOW IS ABU MOSKOWITZ HANGING OUT WITH NFL TRADEMARK LAWYERS HELPING TO KEEP THE SUPERBOWL SAFE? IT ISN’T. HE’S NOT SAVING SUPERBOWL ATTENDEES FROM A GOODYEAR BLIMP, AS IN “BLACK SUNDAY”, BUT HIS BLOATED, MISSPENT BUDGET AND WARPED PRIORITIES CERTAINLY RESEMBLE THE BLIMP–FILLED WITH HOT AIR AND FLYING IN CIRCLES. ALSO, REMEMBER THE TERRORIST DAHLIA? IN REAL LIFE, ABU M IS IN BED WITH HER AND HER ILK, FIGURATIVELY . . . AND MAYBE EVEN LITERALLY. SAFE, INDEED. I think Michigan may lead the country in illegal resaurant help. If you are in town for the superbowl jsut cehck out Greektown, or Mexican-town. You can finmd them by the bunches, but don’t tell anyone, it’s Michigans dirty little secret. Ah, my beloved wannabe Eminem’s Revenge, have you forgotten http://www.imdb.com/title/tt0069332/ ??? You’ve got a plan to stick it to The Man? Yet another shining example of why a seperate Bureau of Immigration, dedicated to immigration enforcement, is needed. Abu M. is a complete joke. I have no faith in ICE while he and the ICE Princess Myers are using it as their personal playground. (BTW, that Debbie posing as a Cowboys cheerleader plot is a pretty good idea, EminemsRevenge!). i really don’t see a story here. now if could prove abu mosk were teaming up with mike tice…………. Let’s cut the crap…how many people wanna see Debbie dressed up plie THIS— http://homepage.mac.com/rpar01/iblog/C178012802/E20050712004742/Media/DCC.jpg ??? Too many experienced ICE agents going to waste on “goat ropes” like this. It has been demoralizing for the the agents who remember how it “used to be” when they arrested folks and put them in jail. Now-a-days they might as well be armed with Water Weenies and hand out road maps to the illegals they come in contact with. Customs was once the law enforcement agency with more search & seizure powers than any other; i.e. warrentless searches, and the ilk. Where will it all end?